Truck Transport | Get Free Car Shipping Quotes Now! Protect yourself and your car by shipping with a reliable car shipping company. Where is your vehicle currently located? Transporting a truck from one point to is considerably more challenging than transporting a car or other automobile. Trucks are much bigger than most passenger vehicles and, therefore, cannot be easily loaded or transported on other trucks. Companies that are willing to do truck transportation are also much harder to find than standard auto transporters. Individuals and companies basically have two truck transport options. One option is to transport it using a tractor-trailer. The other method is to transport the vehicle on a hotshot truck or flatbed reefer. With the tractor-trailer option, the truck is simply hitched onto a trailer either with its front wheels up or all wheels on ground, and towed to its destination. With the second option, the truck will be loaded onto a flatbed trailer or reefer truck and transported to its new home. Though both truck transport methods involve a form of towing, the tractor-trailer option is considerable cheaper than the flatbed option because it involves no specialized equipment. The truck is simply hitched to a truck with an appropriately sized tow dolly, and then secured in place with chains under the body of the truck and around the tires. The vehicle is then towed to where it needs to go. However, finding truck transportation companies willing to tow a truck from one point to another can be somewhat difficult, especially in smaller towns and cities. With the hotshot shipping option, the whole truck will ride on a trailer from origin to destination. Many truck transport companies will use what is known as a step deck trailer to transport trucks that are smaller than 10 feet tall and weigh between 8,000 and 10,000 pounds. A step deck trailer is basically used to transport tall loads. The trailers are usually 53 feet in length with a lower deck that can measure up to 43 feet. A truck can comfortably fit on a step deck trailer. 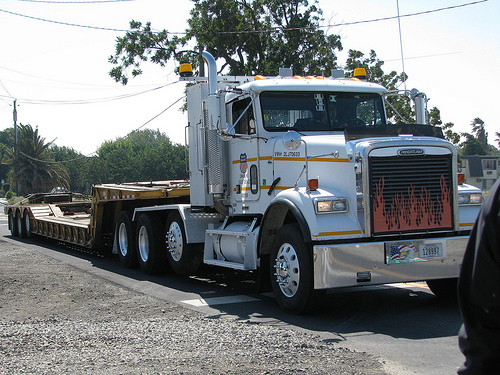 Trucks that are bigger than 10 feet tall, but smaller than 12 feet in size, usually will be loaded and transported on lowboy trailers, which are basically trailers with very little clearance from the ground. Because the decks on lowboy trailers are extremely close to the ground, such trailers are used to transport large trucks and equipment such as bulldozers. Trucks that are over 12 feet tall cannot legally be towed or transported using a tow dolly or the hotshot shipping method. Instead, the transport company will simply drive such trucks to their new destination using their own driver or an independent contractor. Truck transportation rates very greatly depending on the size of the vehicle that needs to be transported, the distance it needs to be shipped, and the type of transportation option that is chosen. The average cost per mile can range anywhere from $1.50 to $2.50, and then go upwards from there depending on the kind of equipment that is required to transport the vehicle.